I hope everyone had as good a weekend as we did. 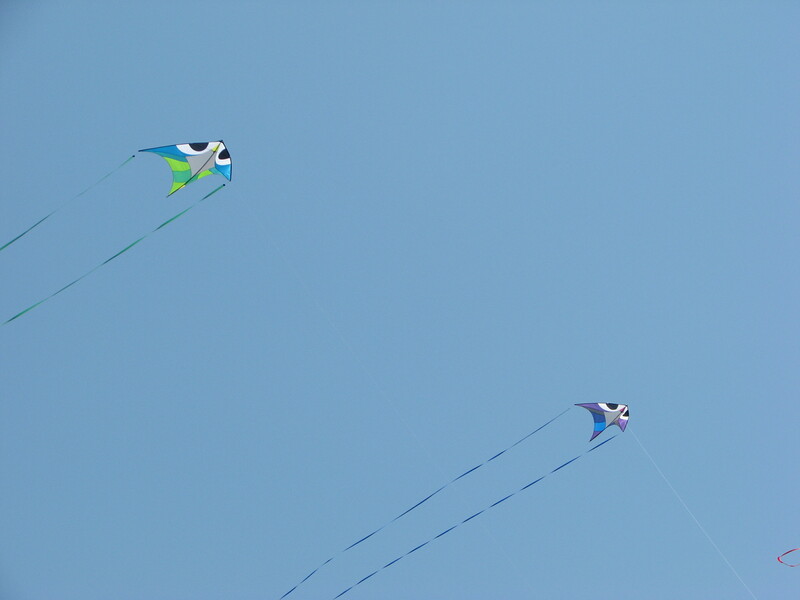 Ours involved a lot of kite flying time and a lot of time in the sun. Family came down for the holiday weekend but that didn’t deter us from flying our kites. Saturday was family day. We spent time together which was wonderful as we don’t see each other that often. Because it was a holiday weekend, the beach was crowded. Gave us an idea on how to plan for kiting. Sunday was our regular weekly club fly. The beach was crowded. We got there very late and were lucky to find a parking spot. There were quite a few out-of-town kite fliers there and most of the time was spent visiting and renewing old friendships. Revolutions were up as well as the blue vamp devil. People are trying that kite out and it is winning over new fliers. The light winds made flying stunt kites a challenge. The winds did pick up as the day wore on. There were a lot of single-line kites up. 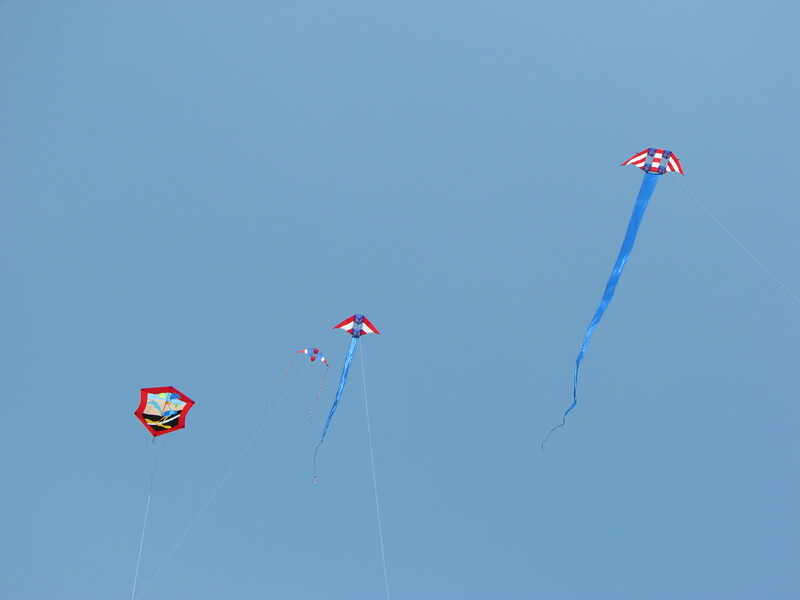 By special request, I flew the three kites I made this spring. My husband finally got his Wala XL together and up. It flew very well and looked great. In fact, there were several Walas in the air. 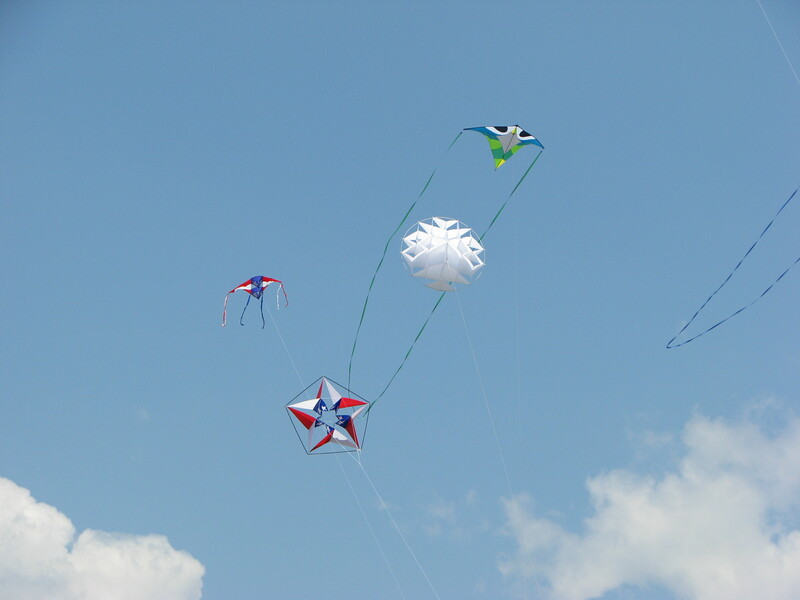 They are made by Flying Wings and are one of the hottest kites this year. The rest of our family spent the time relaxing, swimming and shelling. Despite the heat, we spent about three hours on the beach. Except for a picnic lunch under the trees by the visitors’ center. Monday was a most spectacular day. The local maritime museum holds Maritime Day on their grounds by the water. Maritime Day is a day to get the public out to see what the museum is all about. They have live music, activities for the kids and the kid in all of us, boat rides and free food. They encourage the public to come out and have a good time. It is really fun. When else would you get a chance to ride in a breeches buoy? Personally, I’d rather ride one here than when my life depended on it at sea. Or make a fish print on a T-shirt? In the midst of all this, the kite club puts as much color in the sky as is possible in a small area. Or rather as much red-white-blue in the sky. 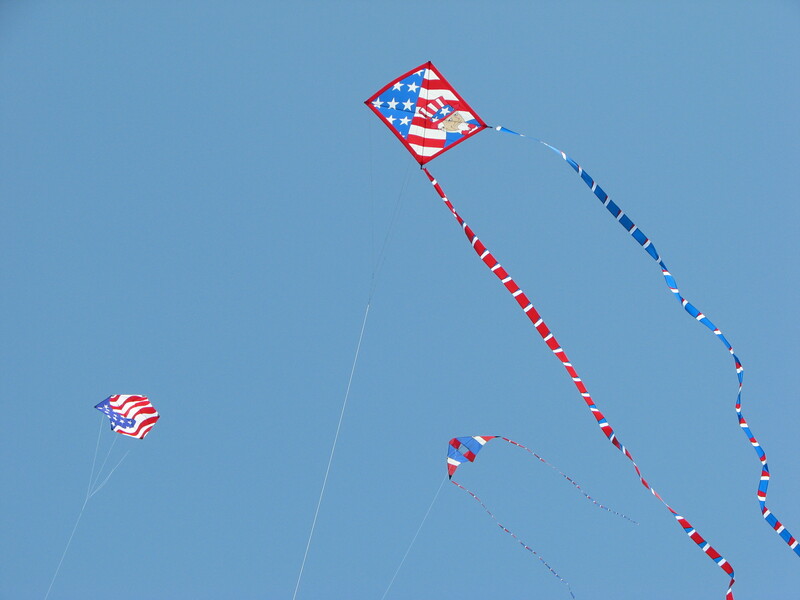 Because it is Memorial Day, we try to all fly red-white-blue kites. 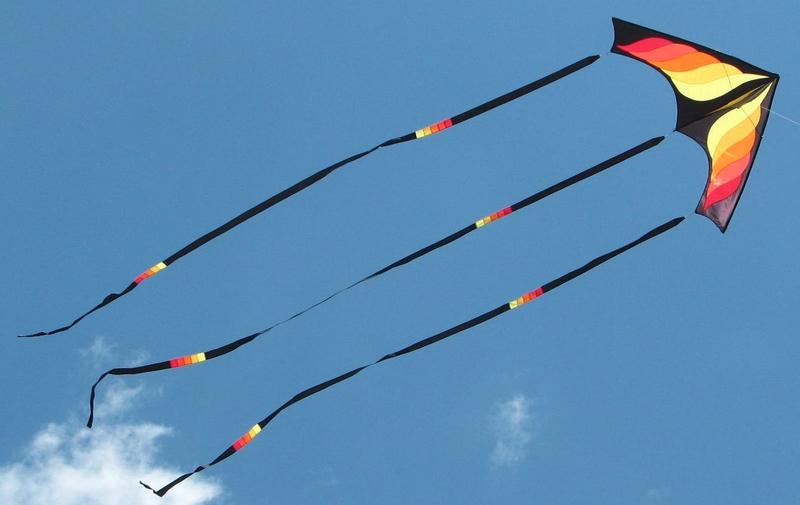 Of course, other kites are welcome. 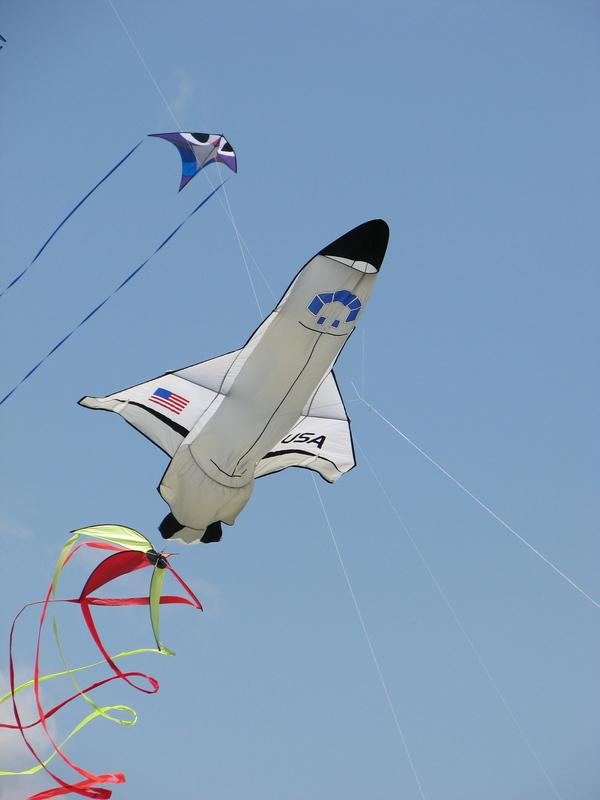 The only request is that we leave the stunt kites home as there is not much space to accommodate them. Most of our out-of-town kite fliers were there. That made it a fun day. Plenty of chatting as well as flying. The winds started out light in the morning and picked up as the day went along. The predominate kite was the box delta. Usually with tails or streamers. There was a regular delta, a parafoil, a diamond and a faceted star in the colors the day. Because of the lighter winds, there were also a collection of Wala XLs. They really look good in the sky. Especially when you have a group of them flying together. 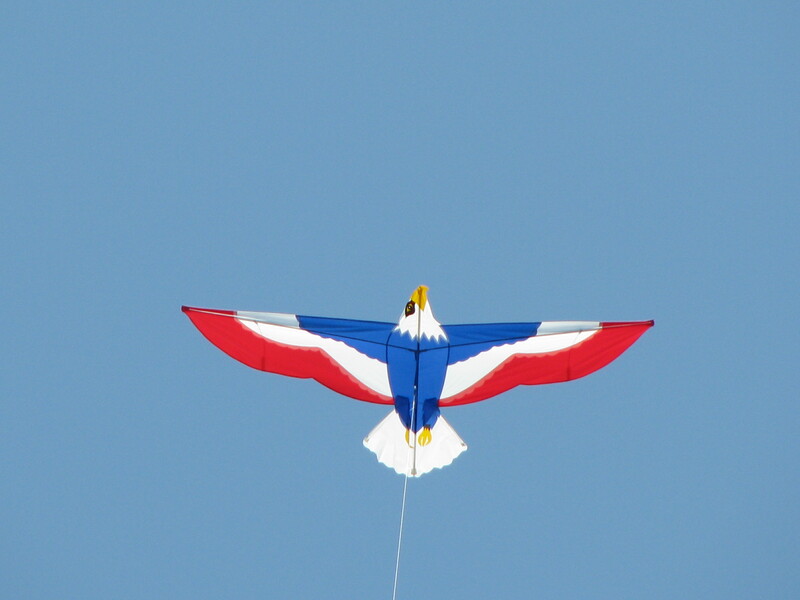 The best kite of the day, in my humble opinion, was the red-white-blue eagle. I’m not afraid to brag. I managed to get an original Sky Delight eagle kite. Signed and dated by Joel Scholz, I have been saving it just for the Maritime Day fly. It went up right away and hung in the sky the whole time. Well, maybe not the whole time. It did have a couple of altercations with the Uncle Sam della porta but they worked things out and both flew peacefully afterwards. Only two kites bit the dust this year and both of them belonged to the same flier. The parafoil took a nose-dive into the neighboring brushy trees. It went in so deep into the stand, a person couldn’t get to it. But due to the ingenuity of some members of our group, they used another kite to lift it out of the trees to an area where it could be recovered. It was pretty amazing to watch. And, of course, I didn’t get any photos of the process. However, during the recovery of that kite, another kite line was cut and a box delta took off on its own adventure. Its line snagged on a power pole in the neighboring development on the other side of the field. So it was recovered also. No kites lost and some excitement to the day. So, after adding another five hours of kite flying and sun to the weekend, it was time to go home. The kite bags are still in the back of the car. And everything needs to be taken out and re-bagged to where it belongs. Especially the lines and the anchors. We can’t find anything. The next special event on our calendar isn’t for a few weeks. I expect I will be starting my next kite sewing project soon. The hardest part will be deciding which one as my list has grown.